An interest rate cut next week? What will the RBA do next Tuesday? Last year, the RBA left rates on hold. Despite increasing unemployment and modest inflation, the bank decided that “a period of stability” was the best course for interest rates. But the meeting was followed the very next day by the release of the National Accounts which showed “dreadful” growth in the quarter, of 0.3 per cent. 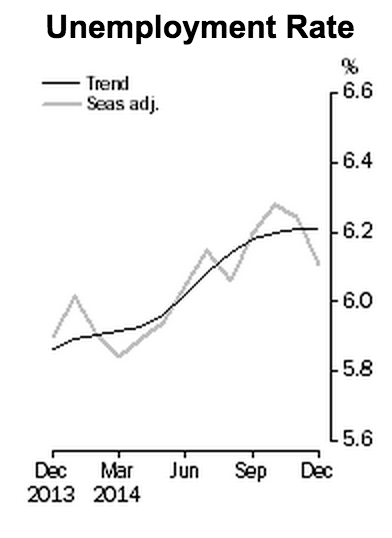 And shortly thereafter, unemployment figures came out looking like a horror show. 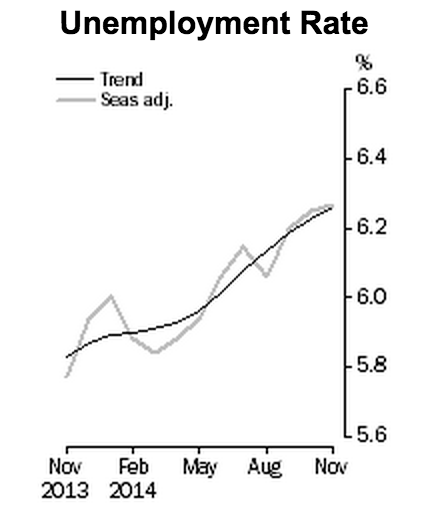 Trend and seasonally adjusted measures converged on 6.3 per cent. A record high. So perhaps Glenn Stevens spent the long summer fretting he’d left the interest rate unchanged for too long. Perhaps he sipped light beer by the pool and bored his bbq guests by extemporising on how a two-month break between the December and February meetings was inappropriate for a modern economy. Perhaps his long summer nights were filled of dreams of a rate cut. But then the New Year began and with it came more positive news on the economy. Unemployment, when the December figures were released in mid-January, was suddenly much better. November figures released in December. This gelled with labour market survey findings that showed job advertisements had been rising for seven consecutive months (PDF in link). The lower exchange rate boosts the economy in several ways. Both by making imports less competitive, and by making it easier to export. It should also reverse the enormous disparity between the number of Aussies who go offshore and the number of tourists who arrive. (A lower exchange rate is not without costs, of course, as many goods, especially capital equipment, is imported). In all these ways, a lower exchange rate does the same work as a rate cut, all without Mr Stevens lifting a finger. Best of all, the lower exchange rate should not lead to higher house prices, which is very welcome as bubbles remain a topic of great importance to the RBA. Last but probably not least, the falling oil price is going to put stacks of cash in consumer pockets. I filled up the car with glee the other day. Unlike falling interest rates, which rob from savers to give to borrowers, lower oil prices are pure upside for consumer buying power, and therefore a more powerful spur to consumer confidence. 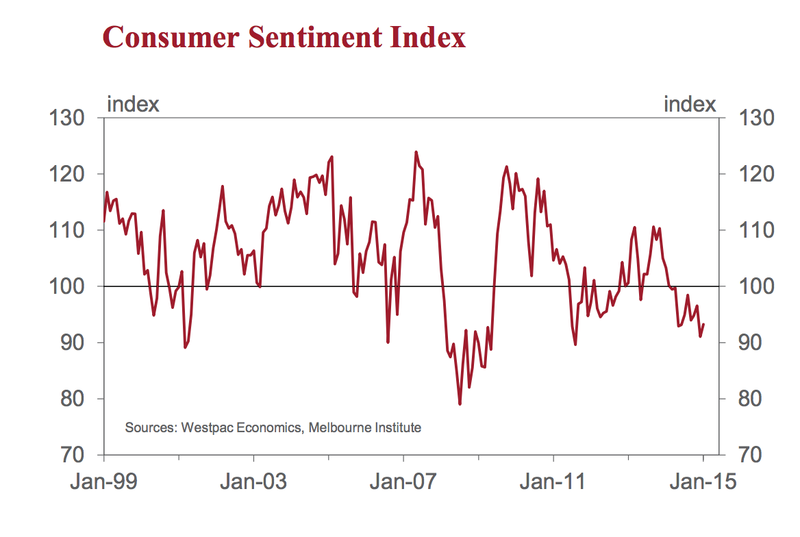 Which is why it’s interesting to see that the actual measure of consumer confidence is down in the dumps, still. It fell 5.7 per cent in December and recovered just 2.4 per cent in January (PDF in link). That same PDF, authored by Westpac, predicts two rate cuts this year. But is that really going to happen? For that to come about, the bank would need to have changed. Inflation was not a major concern and probably won’t be so long as the falling dollar is pushing average prices up, cancelling out the falling oil price. The bank’s two big worries have been the housing market and the unemployment rate. With house prices still rising at the end of last year, it must surely be frightened of a 2015 full of headlines featuring a median house price nearing $1 million in Sydney. And unemployment looks like easing. I bet the RBA will leave rates on hold again. But the one thing that sticks in my mind is this article in the Herald Sun. Business Editor Terry McCrann has a long report on why the RBA will cut interest rates. It is specific enough and well-researched enough to appear to be a leak rather than (like this piece) the author’s own ideas. “The RBA will be reducing both its growth and inflation forecasts in this statement [a report to be released after the board meeting]…. Critically, on (underlying) inflation, the RBA will also make its first point-forecast for June. It is likely to be 2.25 per cent, it could be as low as 2 per cent — either way, significantly, very significantly,below the 2.5 per cent midpoint of its 2-3 per cent target range. Almost as significantly, it will cut its December forecast inflation range to 2-3 per cent and do the same for at least the first half of 2016. If he is right and the forces pushing down on inflation are far greater than those lifting up, then you can’t help but expect a rate cut. It’s an inflation-targeting bank, after all. Tuesday will tell. 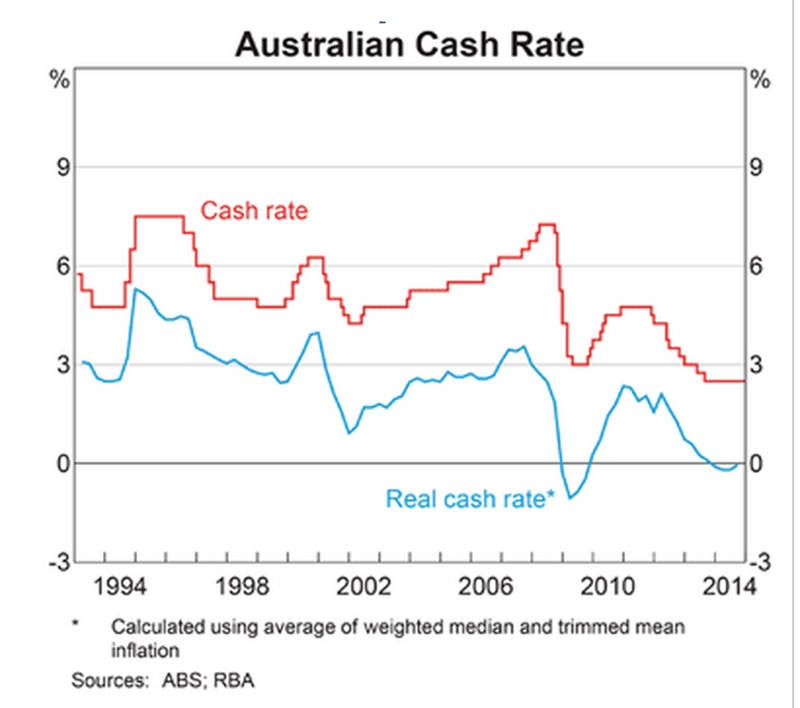 Posted on January 30, 2015 Author thomasthethinkengineCategories UncategorizedTags Australia, Economics, monetary policy, rbaLeave a comment on An interest rate cut next week? You won’t believe how much prize money is on offer at the Tennis. At the Australian Open, first round losers take home enough money to buy three (3) of the automobiles on offer from major sponsors Kia. They can stand on an outside court, not even touch a ball with their racquet, and still take home $34,500. Even those who fail to qualify for the tournament itself are richly rewarded. 64 men and boys and 48 women and girls have their dreams crushed in the first round of qualifying each year. To compensate them, they get $4000 in prizes. Losing in the second round of qualifying garners you $8000 and losing in the third round nets $16,000. Not bad. 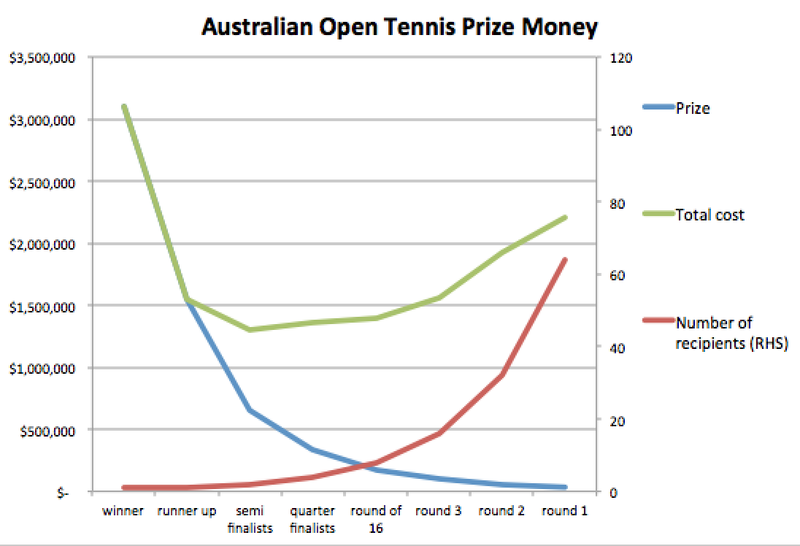 Since I found out the total prize pool at the Australian Open, I’ve been asking people to guess it. Guesses have ranged from $4 million to $12 million. None have come near the true total: $40 million. The prizes in the singles are greatest. The most expensive match of the tournament is the final, of course where the loser gets $1.55 million and the winner $3.1 million. But it is also the only round where the winner collects a cheque. In each other round the winner goes on to a chance of bigger and better things. Excluding the final, the most expensive round for organisers, at $2.1 million, is round one, where 64 losers get $34,000. The prizes are rich enough to cover airfares and accommodation – even for the players who lose at qualifying. Research suggests 150 pros are making enough money to break even in each of the men’s and women’s game. At the same time, some up and comers are probably losing money now in the hope of gaining the experience to make it big later, and others are losing money in the twilights of their career, hanging on in hope of one more glory. (Hi Mr Hewitt!). So, where is that money coming from? Tennis Australia’s Annual Report shows it made $193 million last year from “events and operations.” While there’s not much detail, one can imagine that the vast bulk of that is broadcast rights to that highly rare prize, the Australian Open. Channel Seven in Australia pays $20 million a year. The rights globally are doubtless severalfold higher. Having a grand slam is quite a feat for a country of Australia’s tennis stature. Government supports it, but the support is less direct and therefore less controversial than that provided to the Grand Prix. They prop up the Melbourne and Olympic Park trusts which run the stadiums and have put in hundreds of millions of dollars for their development and re-building. Those stadiums are used for other purposes too, many of which attract tourists from around the world, contributing to the local economy. Happily, Australia’s tax treaties mean athletes are liable for tax in the country where tournaments take place. So Djokovic, the Williams, et al, all face up to the ATO and hand over a chunk. 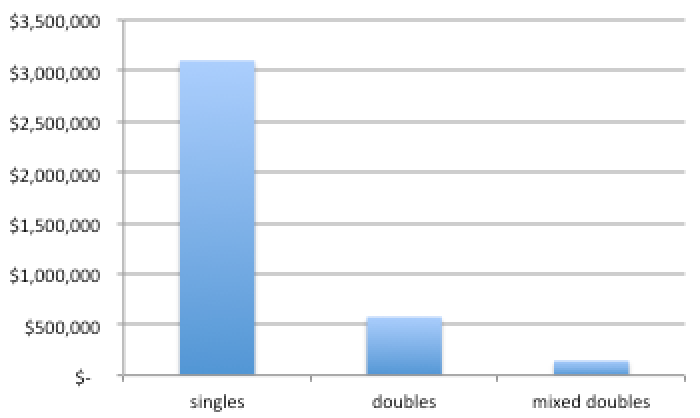 Posted on January 29, 2015 Author thomasthethinkengineCategories UncategorizedTags Economics, Melbourne, tennis4 Comments on You won’t believe how much prize money is on offer at the Tennis. The iPhone is so hot right now. But what about next year? Apple has just one killer app. The iPhone. 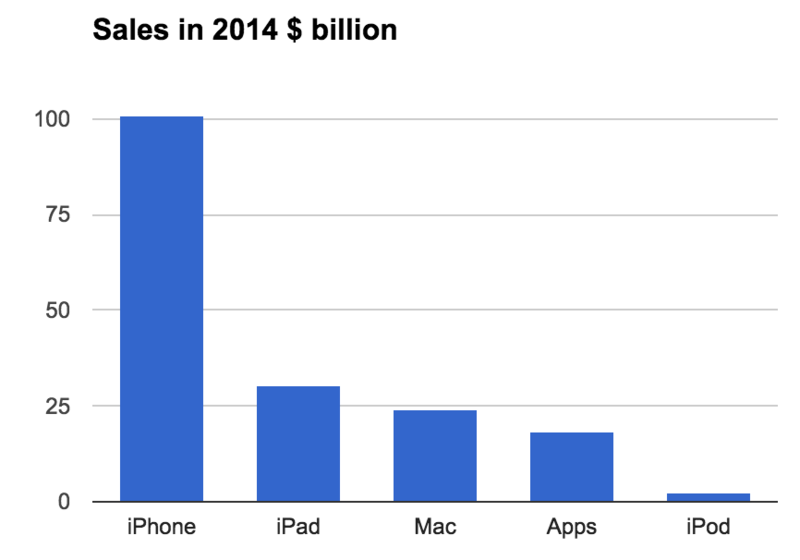 Sales of iPads are falling, sales of iPods are a footnote. App store sales growth is remarkably low (13%) given how fast the phone market is booming. Macs are selling steadily but in small numbers. But the iPhone keeps on giving. In 2014 it sold 169 million units, up from 150 million in 2013. This is quite amazing. And in the first quarter of 2015 it sold a record-beating 74.5 million units. My earlier prognostications that Apple was over-priced look a bit silly now. But there are signs my enthusiasm to call an end to Apple’s rise were just a bit early. Here in the first world, I feel like the iPhone has lost its lustre. Sure enough, sales for “rest of Asia Pacific” were down by 7 per cent. Sales in the Americas rose just 4 per cent. I see my friends buying Android Phones, because they’re cheaper and just as good. Apple’s iPhone is old news. So can Apple make itself last? In some product categories, early market leadership can create decades of dominance. Gillette was the top brand for shaving goods 100 years ago and is still today. Ford similarly for cars. Apple first rose to prominence 30 years ago and is still going strong. Apple is the biggest public company in the world by market value, especially since the recent oil price fall has hit its main competitor Exxon Mobil. But so much of that value rests on the iPhone. And the iPhone is more vulnerable than its sales figures would have us believe. Sales have been driven by the continued release of new models. In China 2014 was the year of the iPhone Five. The iPhone six has sold well, (although Apple is not keen to say how many of its record total sales were the new phone). but its big feature is simply a bigger screen. In this case Apple is following Samsung, not leading. What more can they do? After a certain point, a product can’t be improved much more technically, and become commoditised. Think of your flat screen TV. That product now competes on price, not features. That’s why the rise of Xiaomi, which undercut Samsung, is so important in this market. Apple can retain its status by being the luxury phone maker, but it can’t continue to do that and sell billions and billions of dollars worth of product. And Apple’s next big product launch is the watch, which I believe will bomb horribly. Apple has a big pile of cash, but as its burns through that that in pursuit of the next big thing, its share price must fall. Posted on January 28, 2015 January 28, 2015 Author thomasthethinkengineCategories UncategorizedLeave a comment on The iPhone is so hot right now. But what about next year? Posted on January 22, 2015 Author thomasthethinkengineCategories UncategorizedTags Australia, Economics, Tax, vertical fiscal imbalanceLeave a comment on Can Mr Hockey be saved by a big idea? Could plans London didn’t use be put to work in Melbourne? This tweet came up in my feed a couple of days ago, with the accompanying pictures. The man who tweeted them, Brent Toderian, is a big name in urbanism, based in Vancouver. Of course he is horrified by the way roads and cars dominate the skylines. But I saw something in these pictures that redeemed them. I think they are possibly quite smart. The use of apartment buildings as props for very high freeways was the main aspect that caught my eye. It would not be feasible to drop a road on top of existing buildings. But it may work where you take an existing road, build apartment buildings in its space, and then put the road on top of them. 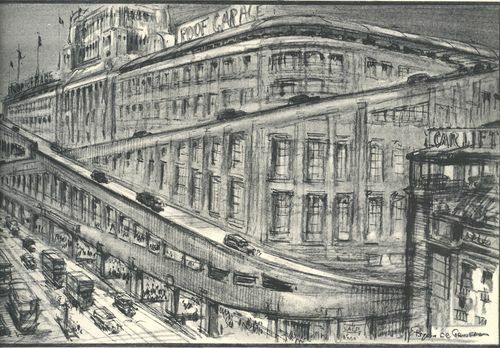 In talking about this plan, I’m especially thinking of Hoddle Street, which is Melbourne’s Achille’s heel. A north-south road near the city that is choked with traffic almost all the time, it has been the subject of countless studies into how to improve it, with little permanent improvement..
What might work is an idea from left-field, like that illustrated by Sir Charles above. Here are the upsides I see. If you take Hoddle Street and fill it with high rises that support a freeway, you get a quick bump in inner city density. Furthermore, the land belongs to the government, so they ought to be able to actually make profit on the property development. 2. Better street level traffic. The street level near Hoddle Street is a horror story. It’s very unpleasant to walk on because of the traffic – noise, fumes, and on the occasional place where they can build up a bit of speed, the fear you’re going to be killed. The houses along Hoddle Street look cheap and poorly maintained – there is obviously a price discount for being on the road. There is very little retail and not a single cafe or shop with outdoor seating on its whole length. If the roadway was way up in the air, (and a couple of the many many traffic lanes were retained for a more normal scale street), the street level might be a bit more comfortable for actual use. Cyclists could use Hoddle Street again. Shops might open up. 3. Better amenity because the elevation is so high. 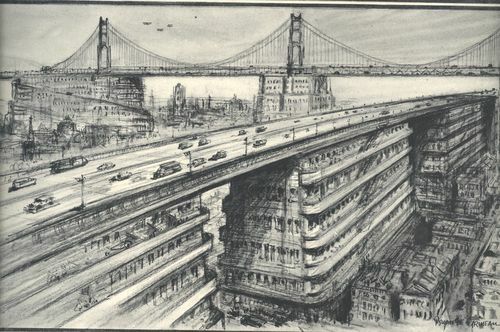 The complaint about elevated roads is the same as the complaint about freeway overpasses. They leave dark empty spaces that are a blight on the urban environment. 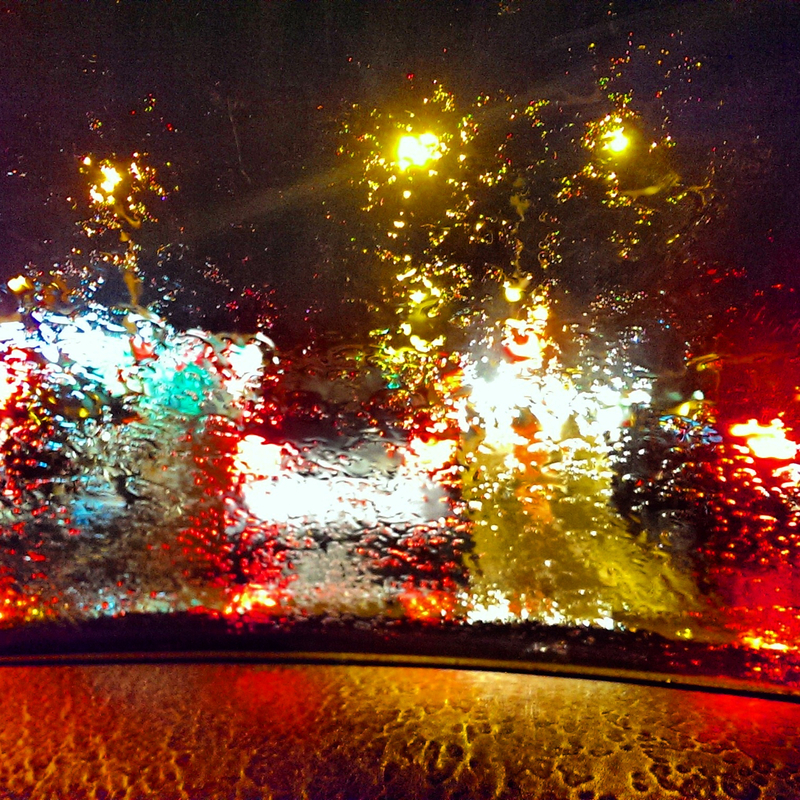 But if you put the road high enough up in the air, the sense of being closed in will disappear. Even better, if the supports for the freeway are not just concrete pillars but actual apartment buildings, the passive surveillance of these areas would be much better. I would imagine that top-floor apartments, right under the roadway, would be less attractive as they would get less sun and more rumbles from above. But if they had balconies on the sides the road does not extend, there is no reason they could not be full of light. The shadow from the entire structure will be vast over a wider area than a smaller freeway, but by having it so high, there will be no single space that is permanently shadowed and unattractive for licit activity. That would probably have to circle around the building to descend, as per the pictures.. And I’m not convinced the value of the apartments encircled by those exits would be so high. Still, not every building would be an exit, and some exits could ramp away from the buildings. A more complete set of things being proposed by Sir Charles Bressey 80 years ago can be found here. Nb. I do not agree with turning Trafalgar Square into a multi-storey parking garage. Posted on January 21, 2015 Author thomasthethinkengineCategories UncategorizedTags Hoddle St, infrastructure, Melbourne, roads, urbanism5 Comments on Could plans London didn’t use be put to work in Melbourne? Your favourite government policy is going to make inequality worse. According to a new working paper by economists at Stockholm University and the University of Chicago, a key factor making unskilled workers worse off is broadband internet. That means the NBN (which may be the most popular infrastructure investment ever announced in Australia) won’t be good for everyone. The study had access to amazing data on 80 per cent of firms and 70 per cent of employees in Norway in the period 2000-2008, during which time Broadband Internet was rolled out slowly in Norway, allowing meaningful comparisons. NORWAY. By Heinrich Pniok. Source Wikipedia. 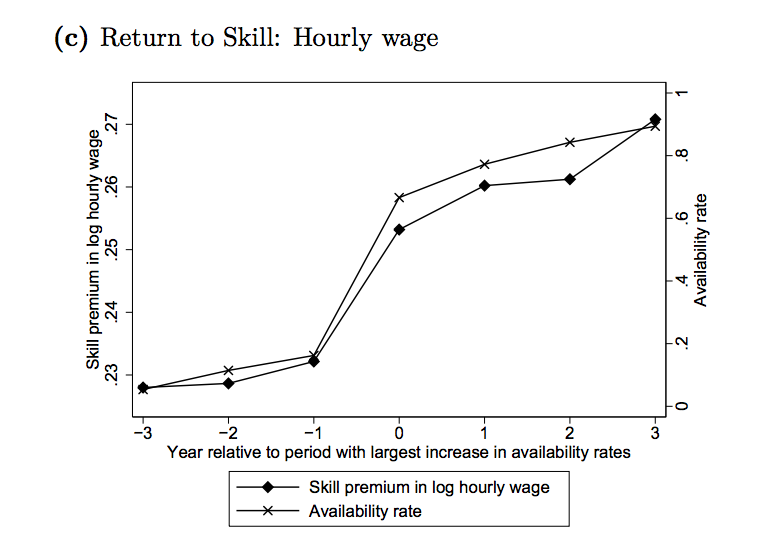 If you have a university degree, you are considered to be “skilled labor.” The premium for skilled labor increased very neatly alongside broadband availability as it rolled out in Norway. The researchers constructed counter-factuals to measure what might have happened in the absence of high-speed internet. They show the gap between skilled and unskilled would have been lower if the optical fibres had never crossed the fjords..
Broadband internet is obviously putting the postman out of work, but it is apparently having a less obvious effect on a range of other routine but non-manual jobs. This is very much worth bearing in mind as the internet enriches and enlivens our lives in so many ways. This is not an argument against the NBN. We need high-speed internet and we’re going to get it one way or another. It’s an argument for being aware that some people get left behind. The smartest policy we can institute to deal with that is high quality, universal education. This should start with high quality earl childhood education (this is extremely important to ameliorate skill-gaps that can develop in disadvantaged populations even prior to starting school), extend through good quality public schooling (needs-based funding as per the Gonski Report is a good start), and culminate in excellent universities that remain highly accessible (this would probably preclude the deregulation currently being proposed by the federal government). Posted on January 20, 2015 January 20, 2015 Author thomasthethinkengineCategories UncategorizedTags Economics, internet, nber, nbnLeave a comment on Your favourite government policy is going to make inequality worse. This could be the end of Australia as a right-wing country. If the Coalition government loses office after a single term, that will be a lesson that will echo for generations. No government since 1929 has lasted just a single term. The Budget of 2014-15 will go down in history as a masterclass of how to reverse an enormous lead. The government’s win in the 2013 election was enormous. The coalition won 53.5% to 46.5% – the strongest two-party preferred result since Howard beat Keating in 1996. Labor lost a whopping 17 seats. But in the offices of Joe Hockey and Matthias Corman, this grand electoral advantage was soaked in petrol, and on the first Tuesday in May, they lit the spark. The Budget was reviled as soon as the government started leaking its details. That sent them to their lowest poll number of 45% – a level to which they have sunk three times. Some political events pass by, and others stick in the collective imagination and become a living part of our political reality. These events are political touchstones. The events aboard the MV Tampa, (Prime Minister Howard refused entry to Australia to a group of refugees) is a good example of a political touchstone. 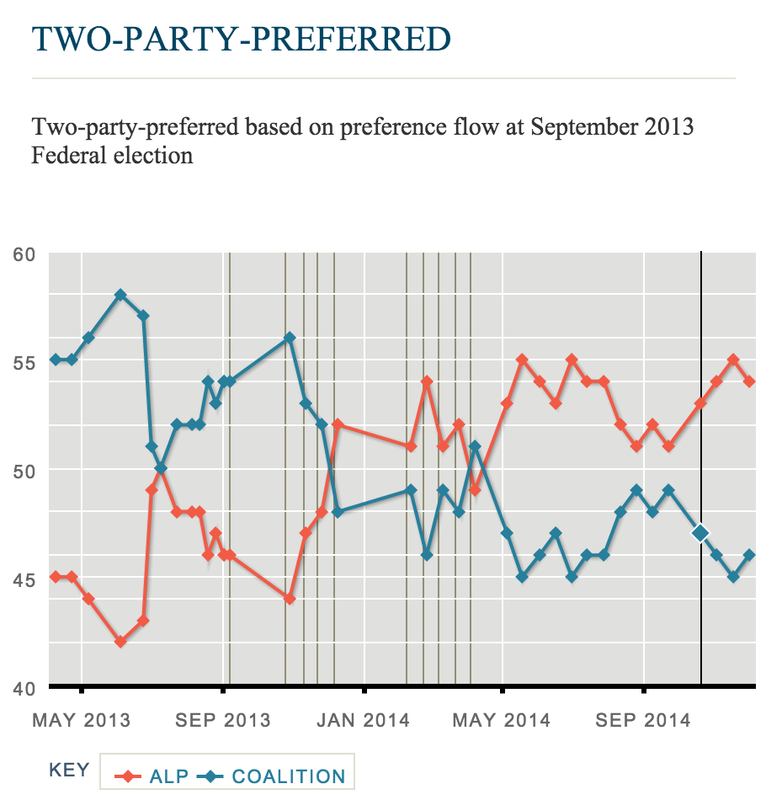 Howard’s poll standing shot up, saving an election that had looked very shaky. That has never been forgotten – the existence of a range of harsh policies including detention centres in Nauru and PNG can be traced back to that election. The 2014-15 Budget may prove to be another political touchstone. I blogged in June about the metrics that showed this Budget seemed to have captured the public’s attention far more than its predecessors. But the impact of the Budget has proved even more long-lasting than I thought, as the Government struggles to move its policies through the Senate. When this Budget is remembered, the single biggest lesson will be about charging people to go to the doctor. This is a wildly unpopular policy. The memory of Gough is strong. Australians love Medicare. It doesn’t matter that the Government eventually dumped the policy. In fact it makes their situation worse almost, because they suffer all the reputational damage, gaining none of the budgetary advantages. Should this Government lose next year’s election, Medicare will be very very safe for the next dozen electoral cycles. It will find champions on both sides of the political aisle. Indeed, politicians may clamber over each other to fund Medicare better. The second grand lesson of the 2014-15 Budget will be about the deregulation of university. This is an issue I see coming up time and again. Do we want an Americanised higher education sector? The answer appears to be yes if you are a Vice-Chancellor and no if you are everyone else. If this government loses, centralised fee-setting and below market interest rates on HECS would appear to be safe for a long time. The timing for an Abbott government loss would be apt. In the US, the ebb and flow of wealth concentration has reached what looks like its zenith, and the eagerness for a higher tax, lower inequality future is mounting. Such arguments have spilled over to Australia too. The future is one where increased marketisation of public services is going to be very difficult to advocate for. The chance of policy proposals involving higher fees and less regulation ever making it out of cabinet meetings is going to be far far lower. All those MPs will know that their necks will be on the line. The astute political operator might even see links from Australians’ apparent taste for government involvement with health and education to the enthusiasm for the NDIS and paid parental leave, and come up with a rather Scandianavian policy package to present to Australian voters. Our future may be rather more Swedish than American, if the polls don’t tighten before the next election. But that election won’t occur until the second half of 2016, leaving plenty of time for events to intercede. All the shortcomings of Mr Shorten may be yet to be fully known, a deus ex machina scenario involving terrorism or refugees could boost Mr Abbott’s standing at a crucial juncture, he could reform his ways after learning a very hard lesson in the first year of his term, or he could be replaced by Mr Turnbull. This last option would somewhat prove my point, because when the right-wing party is led by a centrist, it shifts the whole spectrum left. Posted on January 19, 2015 Author thomasthethinkengineCategories Uncategorized2 Comments on Australia’s Scandinavian moment.